This isn't going to be a long winded article, but a brief overview and tips on what I've found works for me so please give it a read and hopefully I can help improve your level of protection. Any electronic equipment you may own such as televisions, network & computer gear, home theater equipment, modern washers and dryers, etc. is susceptible to damage caused by poor utility power. Often damage occurs in tiny increments unbeknownst to the user until a catastrophic failure occurs. This is why you should think about protecting your investment right from the start. Surge protection. This is the first line of defense. Its affordable and a must. If you're going to do only one thing tp protect your equipment, get a surge protector. Surges are caused by a variety of reasons such as lightning storms, generation snafus, maintenance of infrastructure and more. I typically use power strips with surge protection but also I use the type that sit right at an outlet. The thing to remember about these surge protectors is that they don't last forever. They contain a protection device known as a MOV - Metal Oxide Varistor. They absorb spikes of energy until they fail. Sometimes they just stop working and other times they burn up. For the latter reason I now try to buy only devices with metal cases, although this isn't always possible. When installing a new surge protector, get into the habit of writing the date on the surge protector with a permanent marker. After 5 years or so, consider replacing them. Its invisibly done its job for a great price and is most likely degraded significantly. You'll notice some have indicator lights to show the protection is working, but you can't rely on that indicator as foolproof. Energy absorption is rated in Joules so when shopping the more the better. Here's a few different surge protectors I personally use and like. Tripp Lite Isobar - Brand name protection, noise filtering, metal housing, high quality. Choose your outlet configuration. Tripp Lite Basic Power Strip - Brand name, noise filtering, metal. Belkin 10 Outlet - Nice large metal power strip with quality components. Tripp Lite 3 Outlet - Small, fits on outlet. Value oriented. Belkin 6 Outlet - Replaces outlet plate and screws into place. 6 outlets swivel. Value oriented. * If your equipment that needs protecting is very expensive and you want to kick it up a notch, consider a surge protector which uses "series mode protection" instead of MOVs. This isn't a cheap option, but when only the best will do this is it. There are no sacrificial components that wear out. I use a Furman Pro-R in my home theater signal processing rack. Besides series mode protection you get advanced filtering capabilities, power factor correction with reserve current, and a slew of other features. There are other companies out there that also produce series mode protection surge suppressors such as ZeroSurge & Brickwall which are a little more affordable. While treating surges at the outlet level is good, you should also consider a surge protection device right at your main breaker panel. This type of device has two main advantages. Its the first place a surge is seen and can act quickly to absorb energy before its distributed to various outlets. Second, they protects every device in your home including split phase 240v appliances! Modern clothes washers, dryers, dish washers and ovens are often found with advanced electronics inside and benefit from this type of surge protection. Also they are no longer expensive and can be found cheaply on Amazon or Home Depot. They aren't hard to install if you're comfortable working inside an electrical panel. If not, its very easy for an electrician to install and shouldn't cost very in labor. I use this Eaton Surge Protector for less than $100, but there are many others. Battery backups not only provide you with extended uptime when the utility power completely fails, but provide a steady source power for times when you have power fail for half second or so. Many times during a blackout when the power is restored it can flicker back and forth for a second or so before its solid. This is also VERY bad for electronics. Battery backups can fill in this gap and prevent damage. They can also provide boost & trim functions which deal with sagging power during brownout conditions as well as over voltage conditions. As you can see they are the second layer of protection next to surge protectors in keeping your electronics safe. Many have built in surge protection as well, but keep in mind if they are MOV based they don't last forever, so I always encourage using separate surge protection in conjunction with battery backup systems. My battery backup of choice is the APC-Smart UPS. I've tried others and always come back to these. APC is the leader in the field of UPS systems. What makes these better than the average lower priced battery backup you find in stores is the fact they output a real sine wave instead of a square wave or stepped square wave, so the output waveform looks identical (and in some cases better) than what the utility company provides. Sine wave output makes appliances with motors start easier, they have less harmonic content to be filtered by the appliance, and some computer power supplies simply refuse to run on a square wave input. When shopping for an APC-Smart UPS, first you must size it correctly for your load. They are rated in volt-amps, which a a measure of power similar to watts. If you're interested in the details of these differences much is published on the internet and can easily be found with a simple search. To make it simple, I'll talk mostly about watts. A very common sized backup is an APC-Smart UPS model SUA1000 backup. Its rated for 1000va / 670 watts. Which means, you can't connect a 1000 watt load to it and expect it to sustain power. There are general rules of thumb I've read about, such as 60% upsizing the backup to the load, but there is wiggle room to be had. If you're battery backup is rated for twice the load you place on it, you'll get longer run time and less stress on the batteries, so that's what I aim for. If you don't know how many watts your load is going to be, grab yourself one of these handy little Kill A Watt electric usage meters to measure the power consumption of anything you plug into it. Speaking of run time, this is an area most people don't think about. At full load 670 watts, our example SUA1000 is good for about 4 minutes of runtime before it shuts down. At half load 335 watts, its rated to run for 4-5 times as long, which takes it out to 18 minutes. See why I like to size them at 2x the load? You get 4-5x return on the runtime. You'll also find that "bigger" backups support heavier watt loads, but don't necessarily give you longer run times, even with smaller loads. However 5-20 minutes often gives you enough time to properly shut down a computer or unplug devices until utility power is restored. That said if your goal is to keep a device running as long as possible, such as a critical system like a boiler's controls, or a sump pump or even your cable modem/router then you need to pay close attention to runtimes and look for an APC-Smart XL backup. The XL means extended runtime. You pay slightly more for the XL models, but you get longer run times, better batteries, more watt capability, and heavy duty components with better cooling. You also get an Anderson connector on the back to plug in additional battery packs for even longer runtimes. In fact, the XLs are the only type I purchase anymore due to these features. An APC-Smart 1000XL for example will run for 10 minutes at full 800 watts and 33 minutes at half power 400 watts. If you have a 50 watt load, it will run for 5 hours! Compare that to the non-XL version which would run a 50 watt load for 3 hours. Models differ, so its very important to research the runtime charts. I find the APC-Smart 1000XL tower to be a really good bang for the buck UPS. It has a longer runtime than the much larger APC-Smart 1400XL, despite its capability to power a larger load. I use one on my DIY network rack and it keeps my router, modem, and main switch and access points running for hours on end. Know that the batteries will typically last about 3-5 years. Expect to replace them at these intervals. The best prices can be found online. I tend to examine my batteries after a few years, because once they start to fail they can crack, bulge and leak. When you do replace batteries, find out how to perform a "reset" to let the UPS know you have new batteries and the runtime will be accurately displayed. My next tip is while these APC models are pretty expensive, you can find them refurbished with new batteries for a great price. My favorite place to purchase them is Refurbups.com Full disclosure - My only affiliation with them is that I'm a happy customer. The prices are about the best I've found from all the online stores. I've bought several from them and I've been satisfied each time. Expect to pay a nominal shipping charge, because these are heavy items. I can tell you my last purchase from them was a 60 lbs rack mounted SMX750 that was double boxed and bubble wrapped and arrived in perfect shape. In a future article, I plan to document playing around with connecting large external batteries on these XL backups to really push the runtime out for days at a time. There is more to it than just plugging them in! My network gear has growing like a travelling watermelon vine, so I decided its time to consolidate everything into some sort of 19" rack. A friend gave me a pair of rack rails a few months ago and I set about figuring out how I was going to implement them. After some research and thought, I found a simple design using 2x4s connected with pocket screws to frame out the rails from a fellow blogger which can be found here Tom Builds Stuff - DIY Server Rack Plans. I've always been pleased with pocket hole joinery via my Kreg Jig. For this build I wanted to go heavy duty and used a Kreg KJHD jig with their Heavy Duty pocket screws. Kreg's KJHD line is for use in 2x4, 2x6, etc lumber. 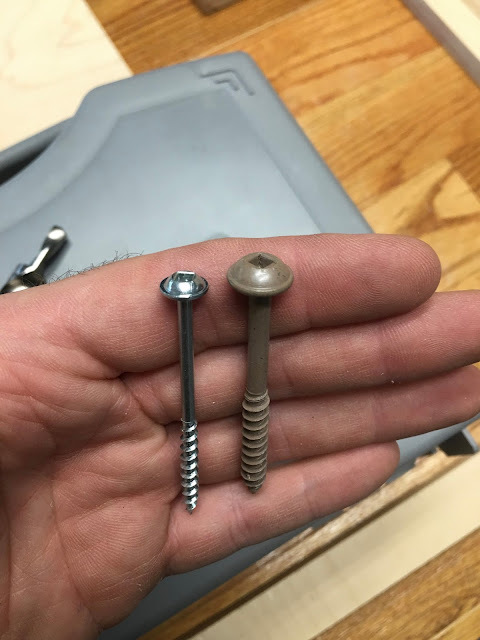 The screws as you can see are heavier and are come with an anti-corrosion coating with for outdoor use. As usual, the whole process of doing pocket joints is a pleasure. Most of my lumber I already had sitting around. Several pieces I had were from old skids that were full of staples that I was going to burn, so I pulled them out of my recycle pile, removed the staples and cut off the bad parts. The wheels are 3" polyurethane with both wheel lock and caster lock cost about $7.50 per wheel. 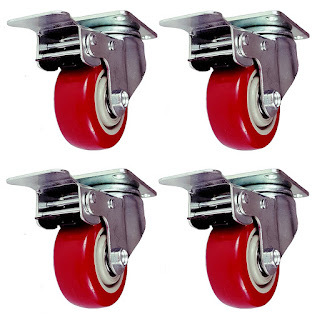 I liked them better than the wheels at Harbor Freight and they were only about $7.50 per wheel. You can find them HERE on Amazon. My rack won't see much rolling, but I wanted to be able to easily swing the rack around to access the back. I was going to make a plywood top and bottom, however I had those recycled 2x4 scraps laying around to put to use and the whole open space concept for airflow was appealing to me. I placed the 2x4s across the width on the bottom because I knew I'd have a long UPS and a PC needing depth support. The top I figured I might have a monitor and keyboard for server access, so I placed 2x4's across front to back to support wide items. Here you can see my initial setup of the rack in my basement, next to a workbench and the rear of my in wall audio rack. With all 4 wheels locked, I was relieved that the rack is pretty solid. This was a concern, as I wanted to keep the NAS as stable as possible. Theres still some cleanup to do, but its up and running. Best of all, there is no glue in the rack and I'm free to break down the entire thing and reuse any of it at anytime I want, or add to it in any way I see fit. Versatility is the name of the game when you build it yourself. Below is a list of some of the gear currently in the rack, with links. Synology DS1817+ 8GB NAS - loaded with 5 HGST 8TB NAS drives in a RAID6 array and 2 Samsung 2TB Spinpoint drives in a RAID0 array. Synology DS211 - backup target 2 Seagate 4TB drives in a RAID0 array. APC SUA1000XL Battery Backup - Extended Runtime battery backup. Dell Studio XPS9000 - Core i7 4GB - Sitting idle for future use. I just installed an interesting piece of gear into the signal processing rack of my sound system, a Carver C-9 Sonic Hologram Generator. Designed by Bob Carver in the 80's, his Sonic Hologram Generator has been a feature in various Carver preamps at the time. The C-9 is a stand alone unit that some have called his finest implementation of the technology. I've wanted to tinker with Sonic Holography in my own system ever since it was demonstrated to me by a friend, Mark "Basspig" Weiss in his incredible sound system. The problem it attempts to solve is called acoustical crosstalk. What's that? For example the sound from your LEFT speaker is heard by your LEFT ear. Inevitably some of this sound is also heard by your RIGHT ear slightly delayed, otherwise known as acoustical crosstalk. This can cause some anomalies in our perception of the sound. Headphone aficionados don't experience this crosstalk at all as you can imagine, which is one of the reasons people love the sound of headphones. It's basic function is to take a 2-channel audio recording and attempt to eliminate acoustical crosstalk between the speakers and your ears. The Sonic Hologram Generator does this by sending an inverted copy of the audio signal to the opposing speaker with amplitude and delay such that it actively cancels the crosstalk at your ear. This can create a similar effect to using headphones, only instead of the sound appearing only inside your head as headphones do, the sound can appear in front of you anywhere in a 180 degree hemisphere. When implemented correctly, it sounds incredible. For a very detailed explanation you can read about it in the patent here. Simplified in the diagram below the Lr and Rl paths get nulled out by producing an inverted signal from the opposing speaker mixed in with the wanted direct sound paths Ll and Rr. This all sounds interesting but there are a few downsides to be aware of. 1. It's very dependent on the program material chosen. Not all music lends itself to the effect. 2. Some rooms it just doesn't work well in. Speaker placement and listening position is critical. See the manual for more information. 3. You must be in the "sweet spot" to hear the effect. If you move about 18" in either direction the effect goes away. This can be adjusted by a small amount with the Listening Aperture button. Despite these shortcomings I look forward to playing around with the C-9 with my 2-channel recordings. You can find the C-9 on EBay for $100 or less most of the time, which is where I bought mine. Upon receiving I opened its up to examine the inside and it looked really clean and in good condition. The power supply electrolytic capacitors showed no signs of distress and the rest of the caps are green polyester film types. I did clean the switches and RCA connectors with Deoxit D5 while it was apart. You can install this in series with any music source like a CD player or if your processor has an external tape loop connection you can use that. There are 2 sets of RCA connectors on the rear, in and out for the left and right. The unit itself has no power on/off button, but it does have a bypass/engage switch. I might add a power switch to the front panel in the future. There are also some other switches for varying parameters to a degree. Listening Aperture can be set to narrow or wide and Injection Ratio can be set to normal or theoretical. This is the amount of crosstalk correction applied. Also note that you may use this device to encode the Sonic Holography signals into a recording itself for playback on a system without the hardware. While I find discrete multichannel audio greatly enjoyable to listen to, the selection is limited. There are a lot more 2-channel recordings in the world to hear. Sure we have Dolby PL2x and DTS's Neo:6 and many other processing modes that create multichannel surround from a 2-channel source but properly dialed in stereo sounds good too. Add in a Sonic Hologram Generator and if your setup is just right you will swear there are speakers in places none exist. That's magical! On the bench today is a blast from my past. A clean Commodore 64 computer and Commodore 1702 monitor I just bought. I spent many nights pounding away at the keyboard on a computer exactly like this in my teen years, along with a dedicated tribe of friends many of whom still have their C64 computers. Despite how advanced emulators are today, there's nothing like having original 8-bit hardware running right in front of you. I popped the top to have a look at the motherboard and everything looks to be in good condition. No bad capacitors or evidence of past repairs or disasters. It's a Version A Rev B motherboard made in Hong Kong in 1984 which makes it a very common board. It has the 8-pin video connector which offers separate chroma and luma signals to present the monitor with a very clear 320x200 NTSC picture. The sound chip (SID 6581) is also socketed in this version. I'm not going to get too geeky about it, as I just wanted to have a nice usable machine to have fun with. I have a stack of 5 1/4" floppy discs I saved from all those years ago with personal data and programs. I'll probably get a few extras along the way like an SD card based drive emulator, a real 1541 5 1/4" disk drive and perhaps a PC interface for the drive as well. These specs look really silly compared to modern day computers, but 35 years ago it was awesome to have such hardware in your home. Clever programmers optimized their code to make the most out of the hardware. Sloppy programming wasn't allowed and RAM wasn't cheap or in abundance like it is today. I've grown tired of ruined tubes of open caulk. For years I've just stuffed a nail or screw into the nozzle and hoped for the best. Looking over possible solutions I decided to give these red caps a try. They are essentially like a little condom that rolls down over the end of the nozzle providing an air tight seal. So far they seem to be working fine. They are semi-reusable. I had one with a little hardened product in the end that I had to toss, but otherwise I've had no issues with these, even with my favorite "glue", polyurethane adhesive. I am reading that if you use this in addition to a nail or screw shoved down into the end, the results are even better. If they save even one tube of caulk they are paid for! Do you have another favorite way to save opened caulk tubes? I'd love to hear your methods. The weather affects everyone's lives daily, so it's important to pay attention to accurate forecasts to make the best use of your time. 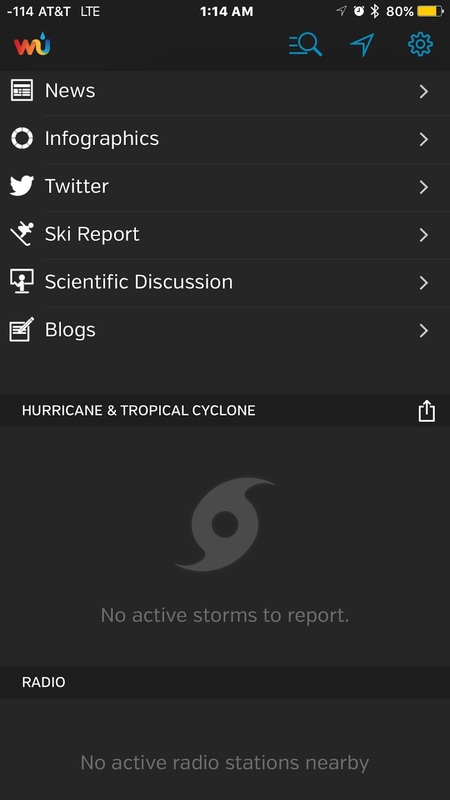 I used to rely on the Weather Channel's website and iPhone app. The Weather Channel has to be the best, right? Well last year sometime they redesigned their website and app to my dislike, and it forced me to look for viable alternatives. Let me tell you I'm so glad they botched their update, because I found something I liked much better - Weather Underground. I'm going to give a quick and dirty run down of why I like it so much. As soon as the app loads, it uses your GPS location and searches for the nearest weather station. You get current weather data from the nearest source, not from the airport on the other side of the county, or the top of the hospital downtown. Some data does come from the National Weather Service (NWS), but local data mostly comes from a PWS - Personal Weather Station. 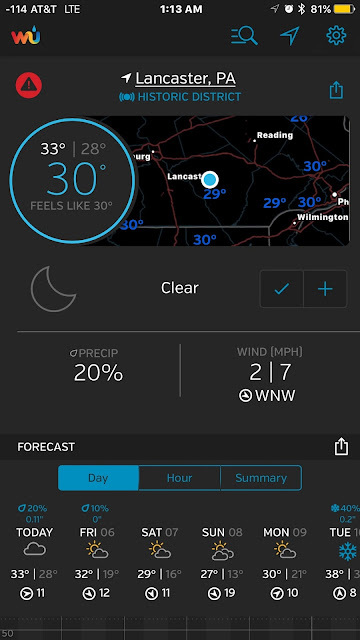 Its great to see a crowd sourced community of 100,000 personal weather stations united in one app. 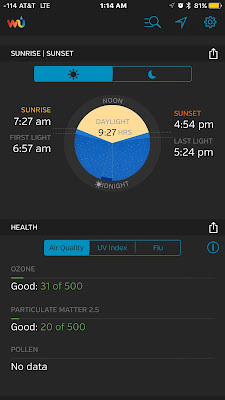 When I'm at my home, I see the data from my own Netatmo weather station. It can't get much more local than that! Also here is a weather map summery. 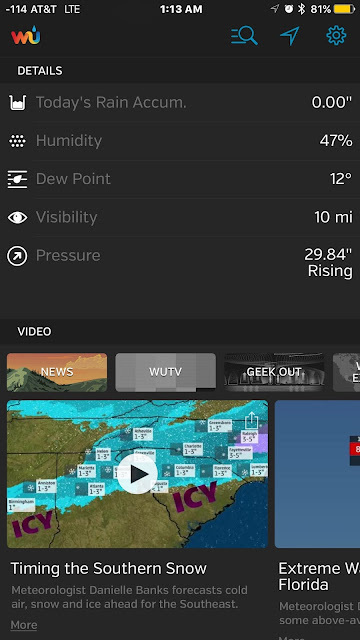 If you touch it, it opens the map full screen with lots of options, like past and present radar, overview of other weather station's data like temperature, rainfall & humidity. The smaller map on the main screen give you a quick preview of what might be in the area, along with the current readings of temps, humidity and winds. Scroll down and you'll find my favorite part. The 10 day forecast chart. Here at a glance you can see the forecast by the day and hour for temperature and precipitation. Its not enough to simply know the high will be 50 degrees or that there is a 10% chance of rain. When? How long? What is the trend for the week? Its all here and very easy to visualize whats going on when. 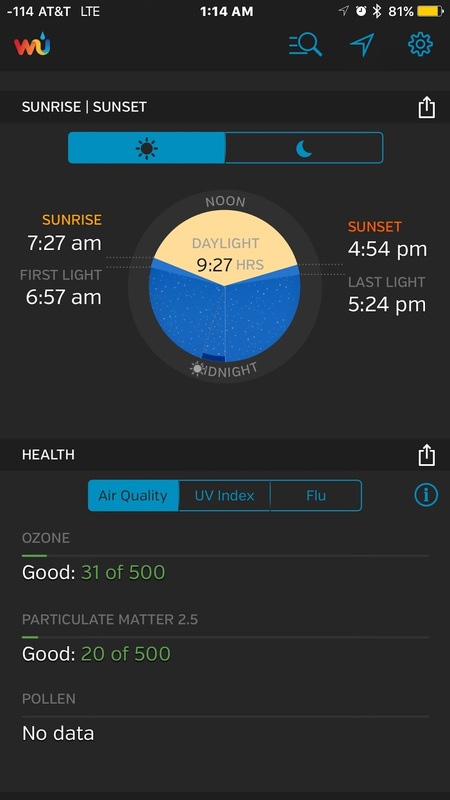 Now you can easily decide the best day AND the best time to mow the grass, wash the car, go skiing, run errands, sleep in, plant your garden, work on the roof, or whatever you have going on without even reading a single number. If its supposed to rain on your parade, at a glance you can see perhaps the rain might be in the evening hours. 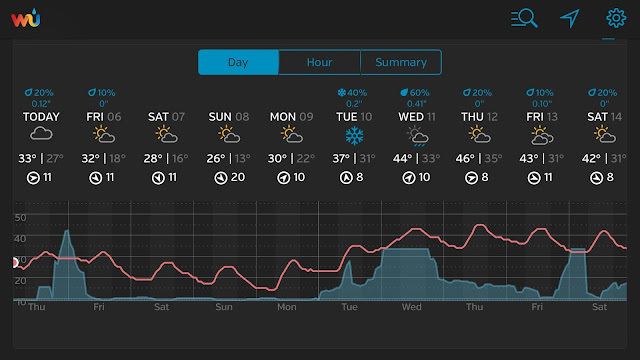 This is what makes Weather Underground so useful. Its such a great tool for time management. Your time is valuable and once its gone its gone. Plan accordingly! The desktop site is even better, adding wind direction with speed. The precipitation graph turns pink when there is snow or ice. Its worth keeping as an open tab on your desktop browser to help plan your daily and weekly activities. 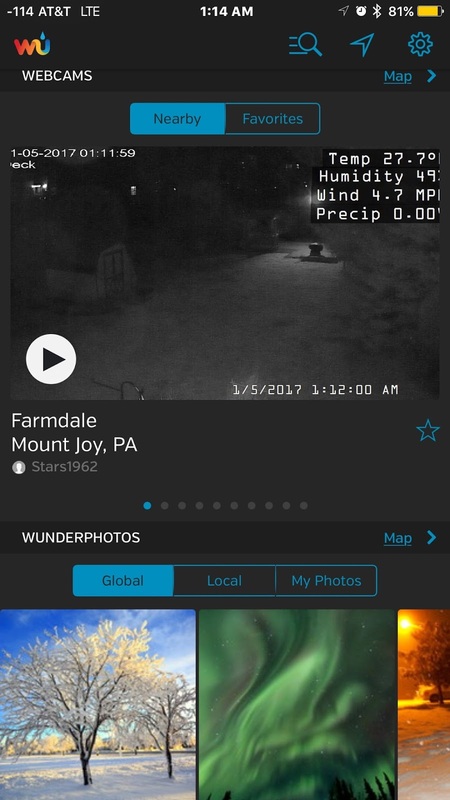 Continue scrolling down on the app and you'll see more local data, along with a video library of weather related news and information. Keep on scrolling... This screen shows the sunrise & sunset times in a nice pie chart. Complete with first light and last light. Click on the Moon tab and you'll see moonrise, moonset, next full and next new moons as well as the current moon. Handy for us amateur astronomers! Next we have Webcams nearby. Some people volunteer outdoor webcams so you can SEE conditions in realtime. You can even set favorites and share your own photos. Finally we have some social media links, forums, and your own personal blog if you choose to do so. Below that will be info about the NEAREST hurricane or cyclone anywhere in the world, even if its 4000 miles away. If you're interested in installing your own personal weather station there are many different weather stations to choose from. Many are expensive and complex to setup with limited ways to view and chart data. 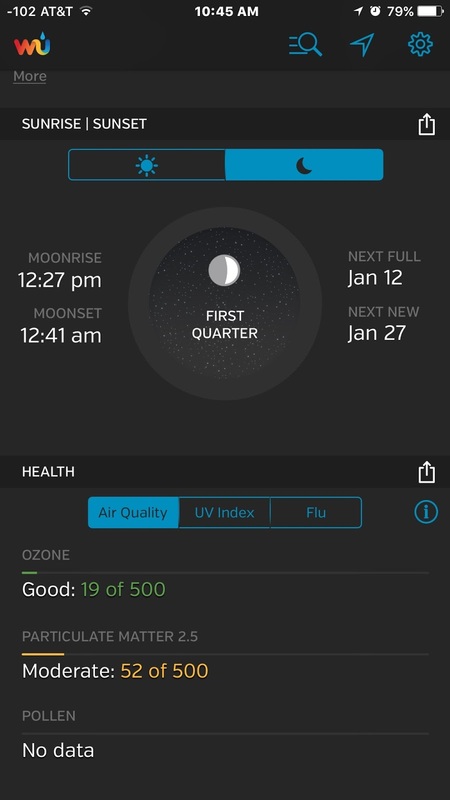 You can start simple like I did with a $149 Netatmo sensor set. This gets you indoor and outdoor temps, humidity, air pressure, as well as indoor co2 and sound pollution levels. Later you can add a rain gauge and wind gauge. Netatmo also has their own unique app and webpage thats really cool and worthy of its own review. 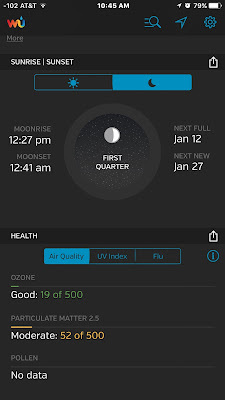 Note that you can choose to keep your outdoor weather station data to yourself, or share it with others either through Netatmo or the wider community on Weather Underground.